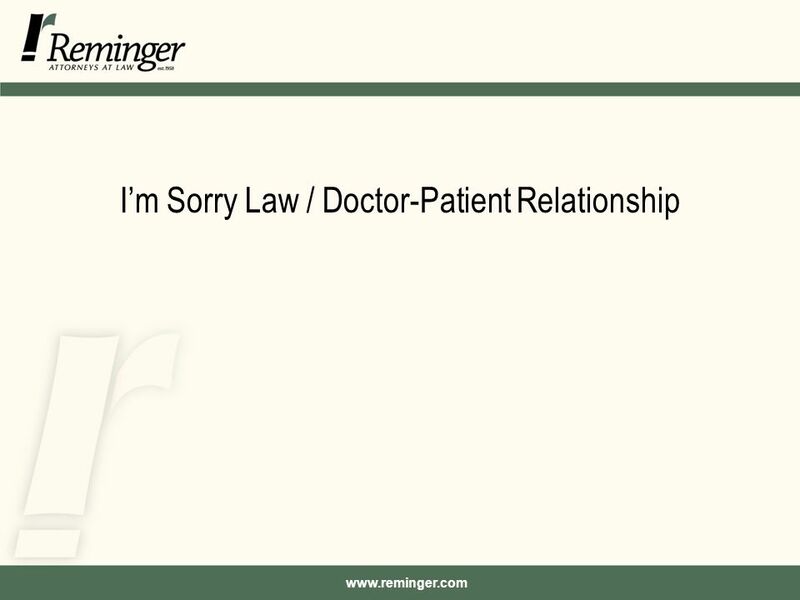 5 www.reminger.com I’m Sorry Law / Doctor-Patient Relationship Background –Initiatives that advocate full disclosure and apology to patients who suffer unanticipated outcomes during medical care are gaining momentum. –35 states have adopted variations of “I’m Sorry” law. 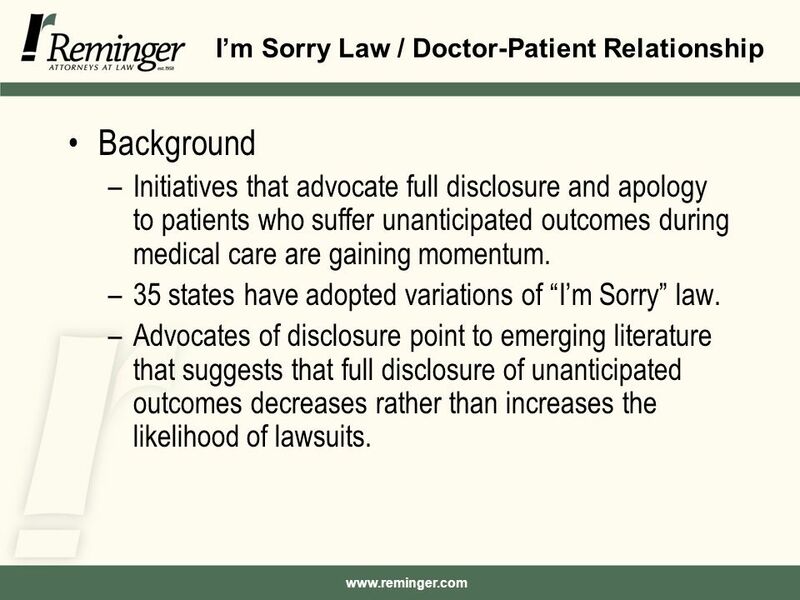 –Advocates of disclosure point to emerging literature that suggests that full disclosure of unanticipated outcomes decreases rather than increases the likelihood of lawsuits. 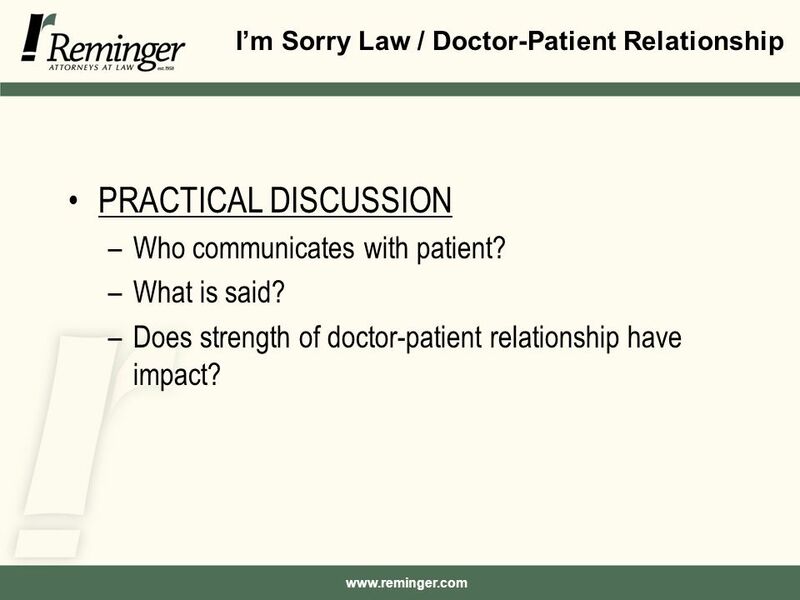 9 www.reminger.com I’m Sorry Law / Doctor-Patient Relationship PRACTICAL DISCUSSION –Who communicates with patient? –What is said? –Does strength of doctor-patient relationship have impact? 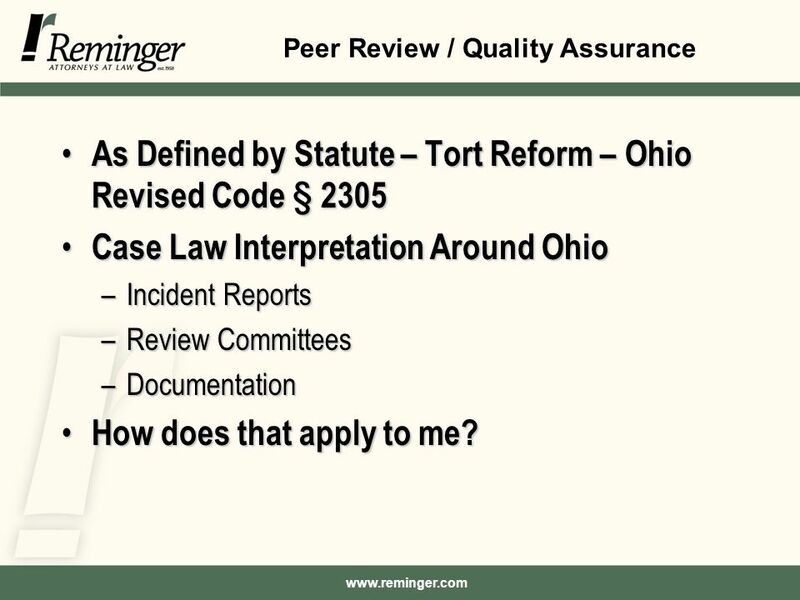 11 www.reminger.com Peer Review / Quality Assurance As Defined by Statute – Tort Reform – Ohio Revised Code § 2305 As Defined by Statute – Tort Reform – Ohio Revised Code § 2305 Case Law Interpretation Around Ohio Case Law Interpretation Around Ohio –Incident Reports –Review Committees –Documentation How does that apply to me? How does that apply to me? 13 www.reminger.com ORC § 2305.25 Health care entity –Any entity, that conducts as part of its regular business activities professional credentialing or quality review activities involving the competence of, professional credentialing, professional conduct of, or quality of care provided by health care providers. Incident report –Means a report of an incident involving injury or potential injury to a patient as a result of patient care provided by health care providers, that is prepared by or for the use of a peer review committee of a health care entity and is within the scope of the functions of that committee. Peer review committee –Means utilization review committee, quality assessment committee, performance improvement committee, credentialing committee, or other. 14 www.reminger.com ORC § 2305.24 Confidentiality Any information, data, reports, or records made available to a quality assurance committee is confidential and shall be used by the committee and the committee members only in the exercise of the proper functions of the committee. 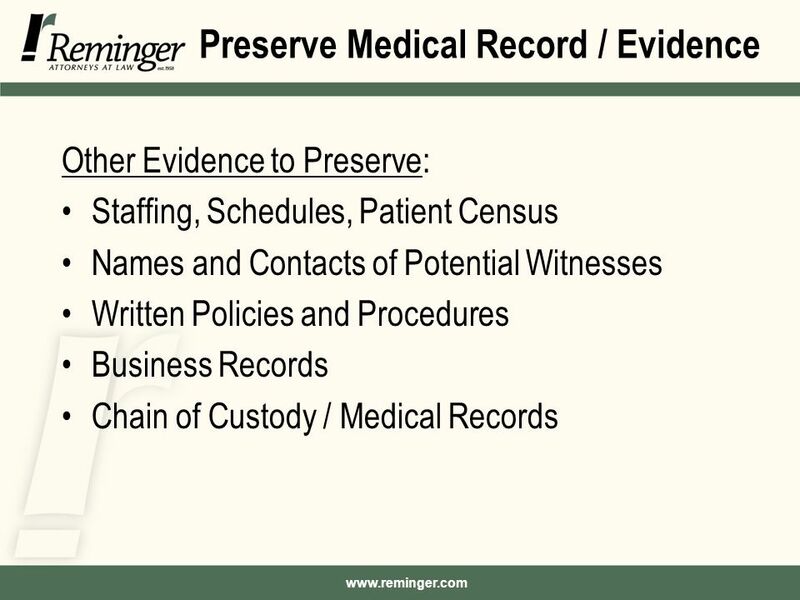 15 www.reminger.com ORC § 2305.252 Protection of Peer Review Committee Information: Proceedings and records within the scope of the peer review committee of a health care entity shall be held in confidence and shall not be subject to discovery or introduction in evidence in any civil action against a health care entity or health care provider. No individual who attends a meeting of a peer review committee, or provides information to a peer review committee shall be permitted or required to testify as to any evidence or other matters produced or presented during the proceedings of the peer review committee. 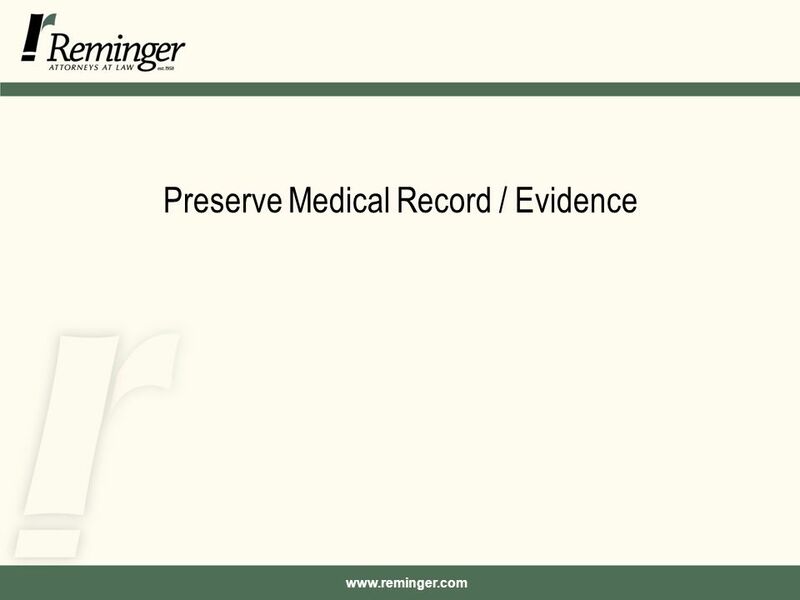 16 www.reminger.com ORC § 2305.253 Protection of Incident Reports: An incident report and the contents of an incident report are not subject to discovery in, and are not admissible in evidence in the trial of, a tort action. An individual who prepares or has knowledge of the contents of an incident report shall not testify, and shall not be required to testify, in a tort action as to the contents of the report. 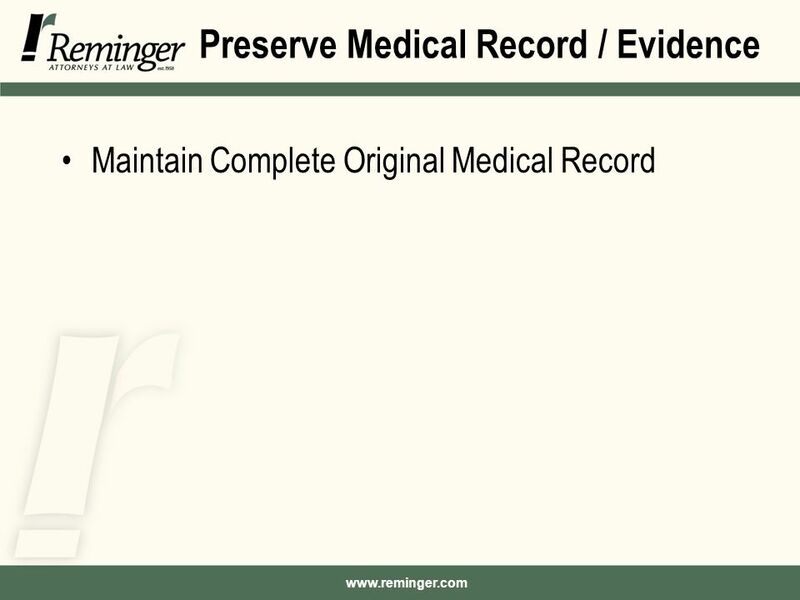 19 www.reminger.com First Prove Existence of Statutory Peer Review Committee Bansal v. Mt. 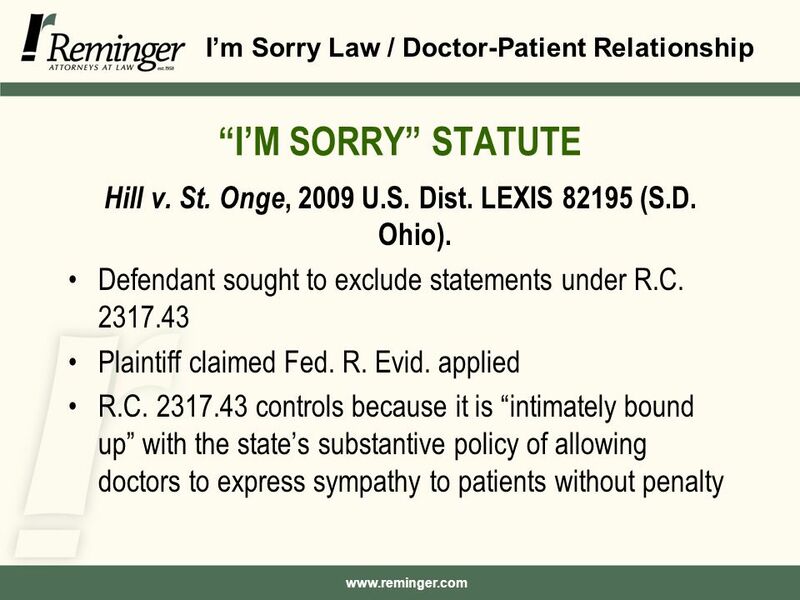 Carmel Health Systems, Inc. – Franklin County 2009 Bansal v. Mt. 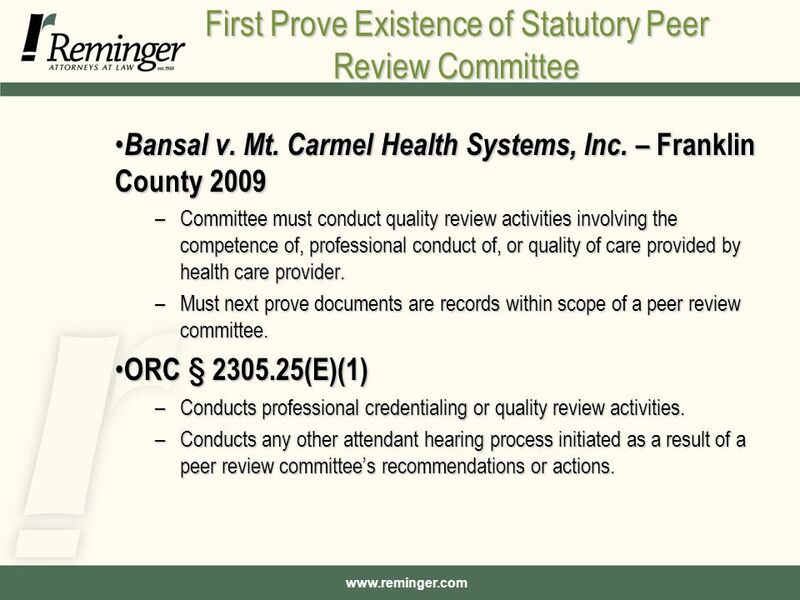 Carmel Health Systems, Inc. – Franklin County 2009 –Committee must conduct quality review activities involving the competence of, professional conduct of, or quality of care provided by health care provider. –Must next prove documents are records within scope of a peer review committee. ORC § 2305.25(E)(1) ORC § 2305.25(E)(1) –Conducts professional credentialing or quality review activities. –Conducts any other attendant hearing process initiated as a result of a peer review committee’s recommendations or actions. 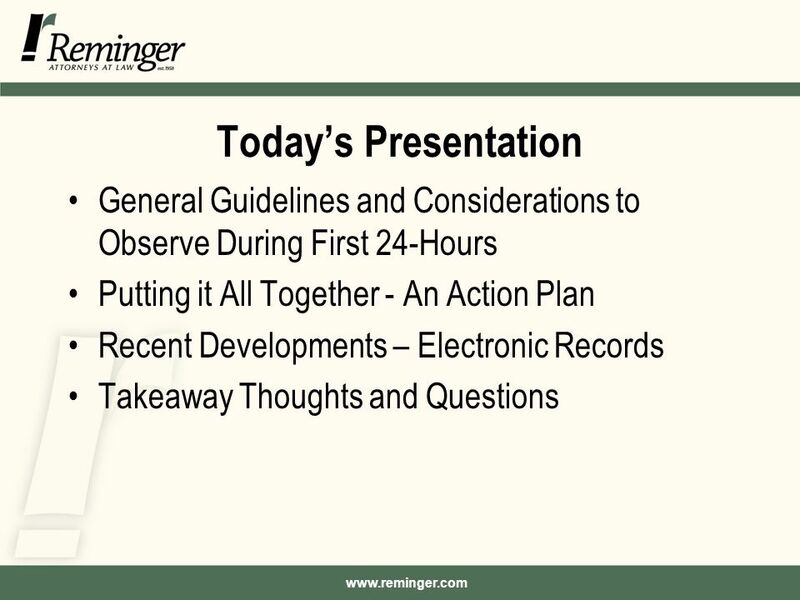 20 www.reminger.com Can We Just Call it an “Incident Report”? Rinaldi v. City View Nursing & Rehab. – Cuyahoga County 2005 Rinaldi v. City View Nursing & Rehab. 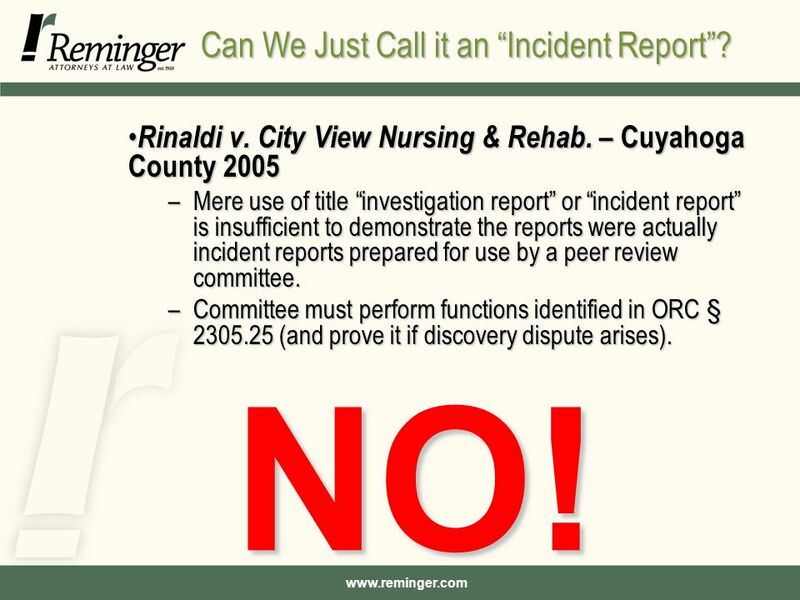 – Cuyahoga County 2005 –Mere use of title “investigation report” or “incident report” is insufficient to demonstrate the reports were actually incident reports prepared for use by a peer review committee. 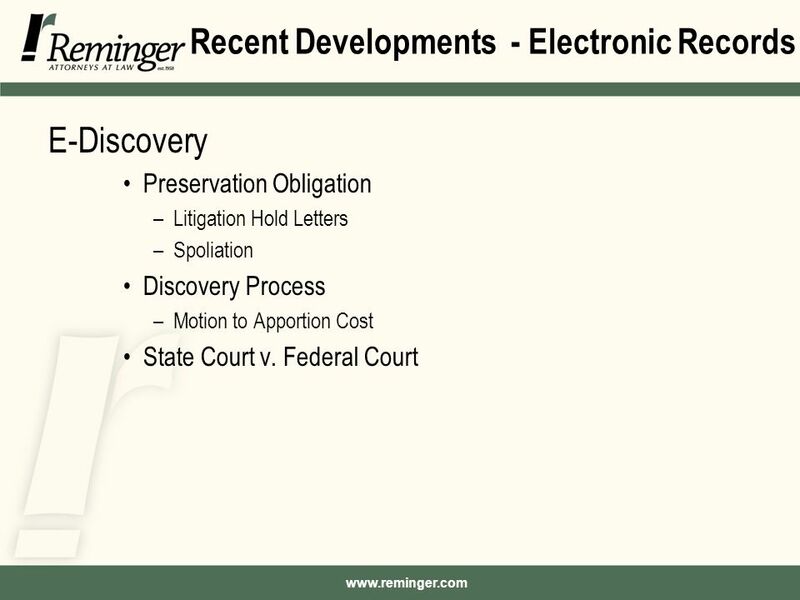 –Committee must perform functions identified in ORC § 2305.25 (and prove it if discovery dispute arises). NO! 22 www.reminger.com Privilege is NOT Absolute Brzozowski v. Univ. Hosp. Health Sys. Cuyahoga County 2005 Brzozowski v. Univ. Hosp. Health Sys. 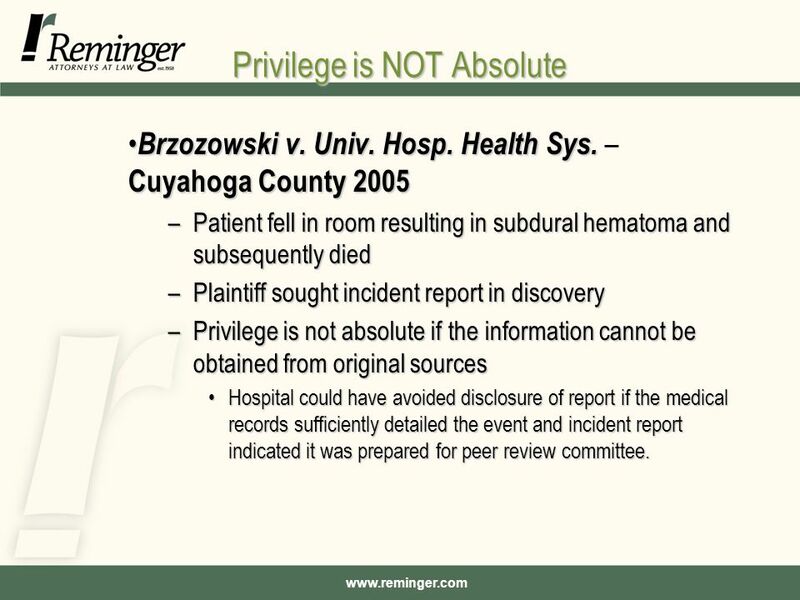 – Cuyahoga County 2005 –Patient fell in room resulting in subdural hematoma and subsequently died –Plaintiff sought incident report in discovery –Privilege is not absolute if the information cannot be obtained from original sources Hospital could have avoided disclosure of report if the medical records sufficiently detailed the event and incident report indicated it was prepared for peer review committee.Hospital could have avoided disclosure of report if the medical records sufficiently detailed the event and incident report indicated it was prepared for peer review committee. 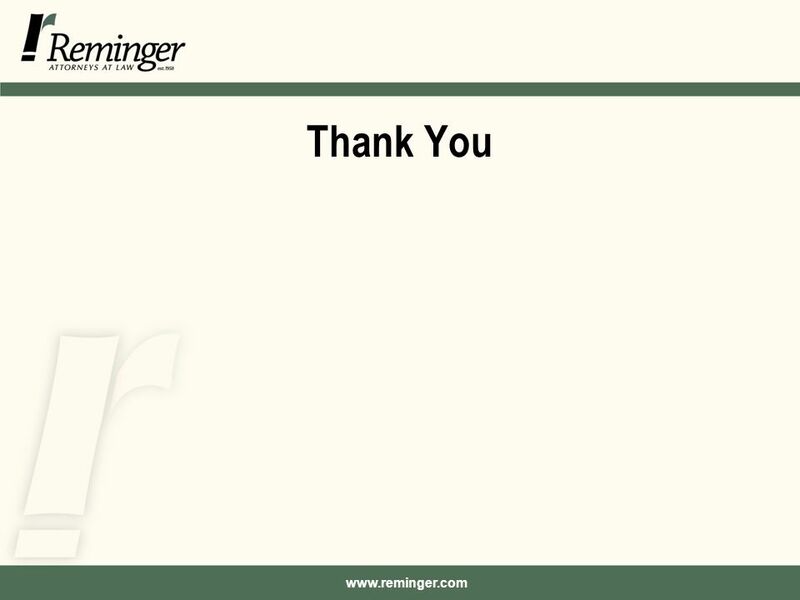 23 www.reminger.com You Have The Burden! Manley v. Heather Hill – Geauga County 2007 Manley v. Heather Hill – Geauga County 2007 –In order to invoke the peer review privilege, a defendant must establish that the documents being sought were incident reports prepared by, or for the use of, a peer review committee. –Party claiming privilege must prove the existence of the peer review committee and that the committee investigated the incident in question. –Party asserting a report as an incident report has the burden of proving it is an incident report. 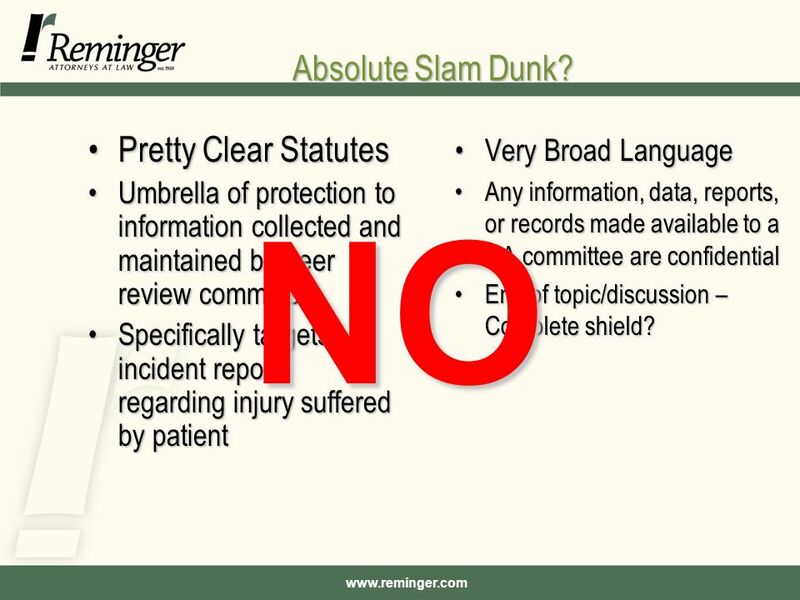 24 www.reminger.com NO Privilege Under ORC § 2305.253? Flynn v. Univ. Hosp. – Hamilton County 2007 Flynn v. Univ. Hosp. 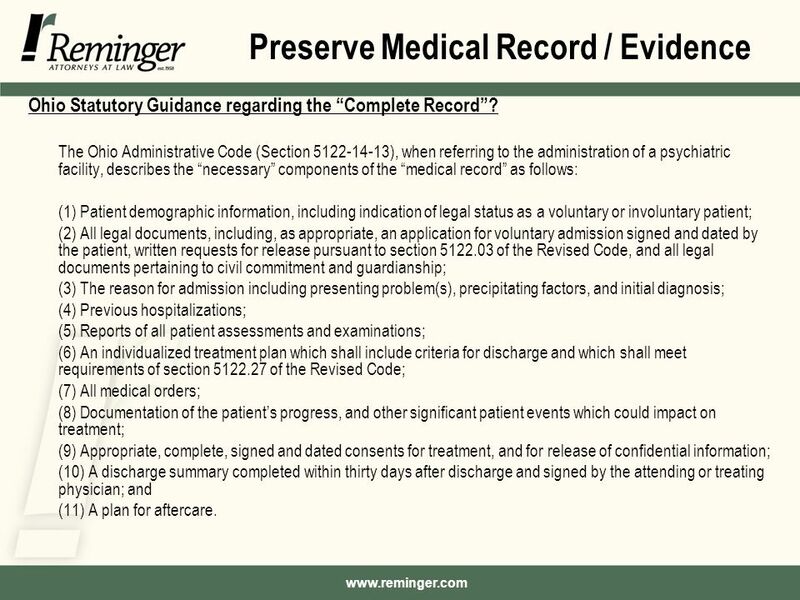 – Hamilton County 2007 –Hospital failed to show that an incident report was privileged under statute because it failed to show what was required under ORC § 2305.25(D). –Did not prove it was created for purpose of submission to quality assurance committee. 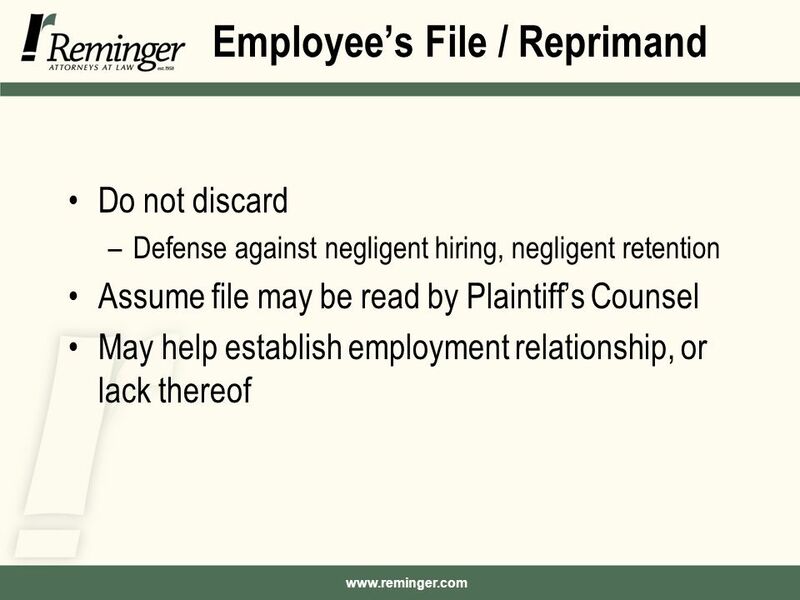 – However, the attorney-client privilege did apply Incident report was prepared for the attorney in its risk management department for the specific purpose of notifying the department and its outside legal counsel of possible claims.Incident report was prepared for the attorney in its risk management department for the specific purpose of notifying the department and its outside legal counsel of possible claims. 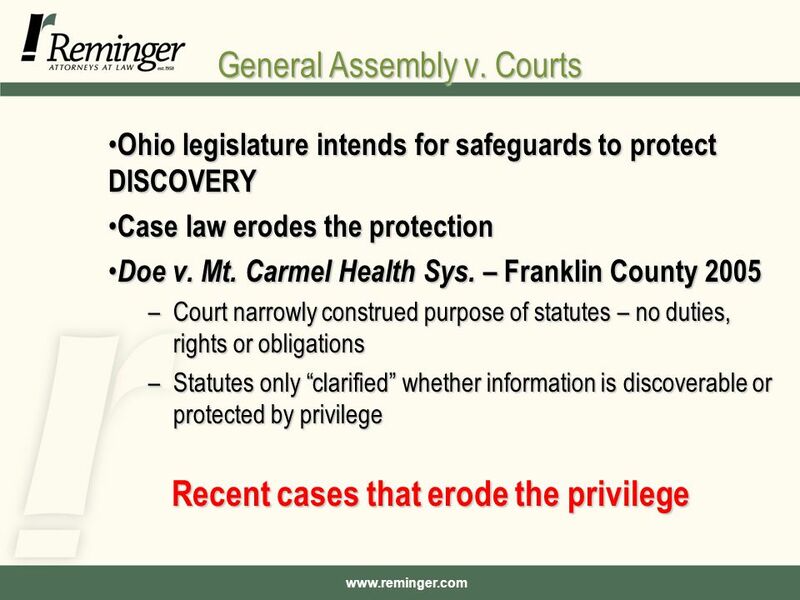 25 www.reminger.com Always Submit to a Peer Review Committee to Protect Privilege Freudeman v. The Landing of Canton – United States District Court (Northern District of Ohio) – May 2010 Freudeman v. The Landing of Canton – United States District Court (Northern District of Ohio) – May 2010 –Nursing home had to disclose reports of patients’ medication errors to plaintiff after conceding no peer review protection (no indicia documents were used for peer review and protected). Send report to peer review committee to ensure privilege argument.Send report to peer review committee to ensure privilege argument. 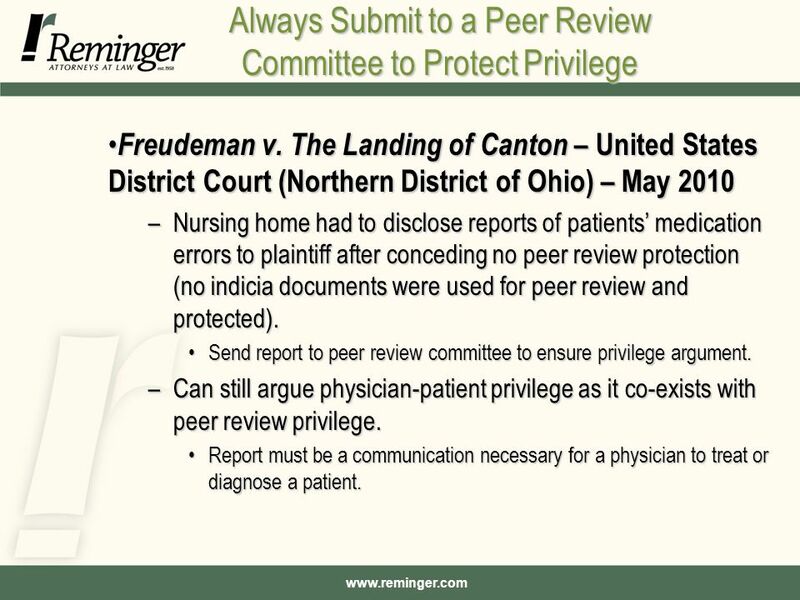 –Can still argue physician-patient privilege as it co-exists with peer review privilege. 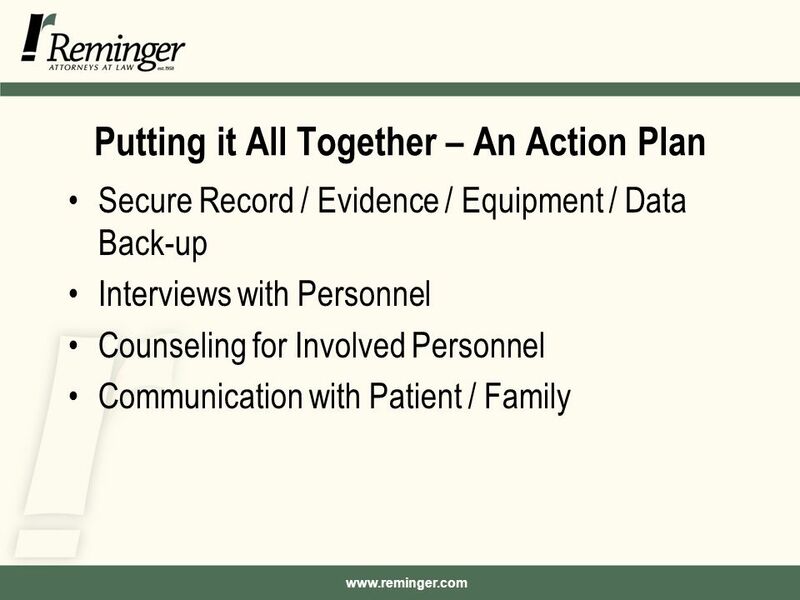 Report must be a communication necessary for a physician to treat or diagnose a patient.Report must be a communication necessary for a physician to treat or diagnose a patient. 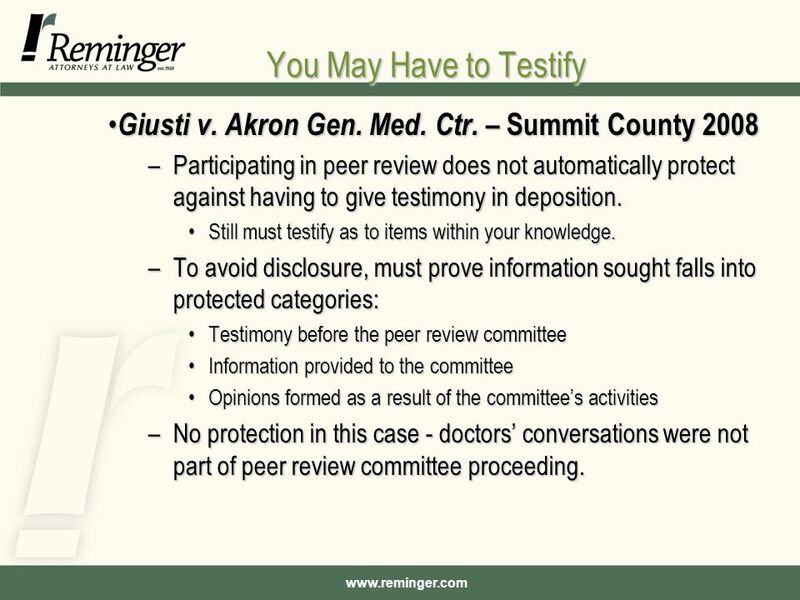 26 www.reminger.com You May Have to Testify Giusti v. Akron Gen. Med. Ctr. – Summit County 2008 Giusti v. Akron Gen. Med. Ctr. 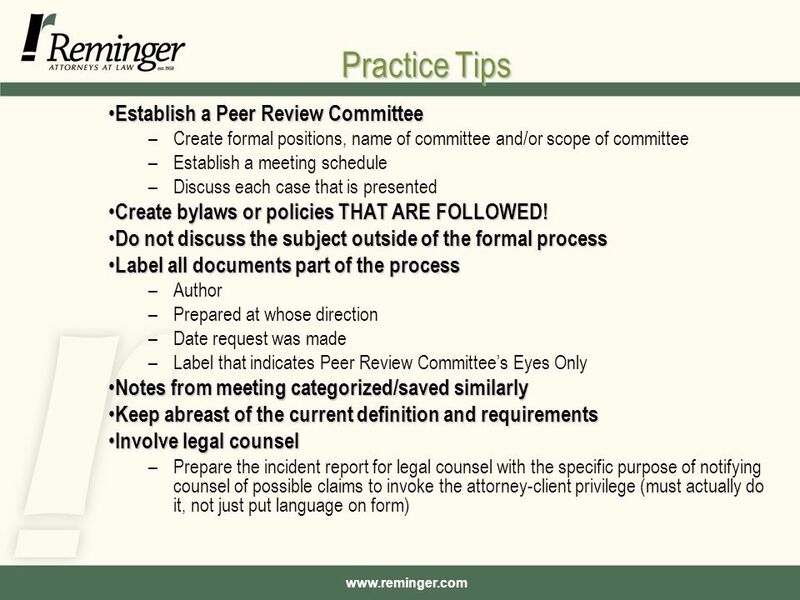 – Summit County 2008 –Participating in peer review does not automatically protect against having to give testimony in deposition. Still must testify as to items within your knowledge.Still must testify as to items within your knowledge. 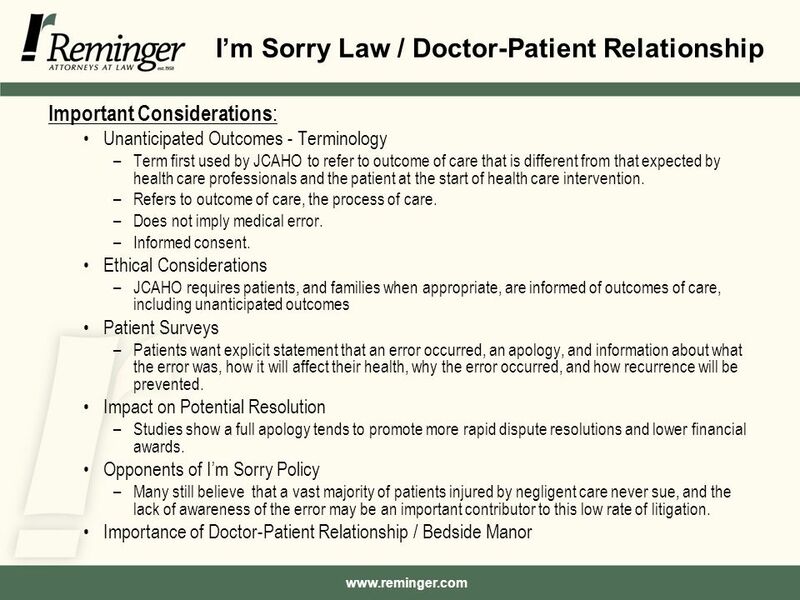 –To avoid disclosure, must prove information sought falls into protected categories: Testimony before the peer review committeeTestimony before the peer review committee Information provided to the committeeInformation provided to the committee Opinions formed as a result of the committee’s activitiesOpinions formed as a result of the committee’s activities –No protection in this case - doctors’ conversations were not part of peer review committee proceeding. 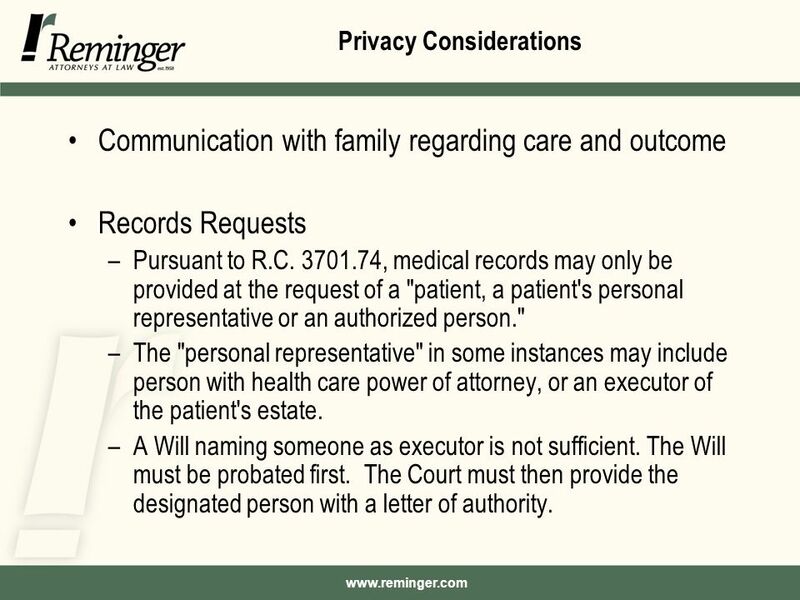 38 www.reminger.com Privacy Considerations Communication with family regarding care and outcome Records Requests –Pursuant to R.C. 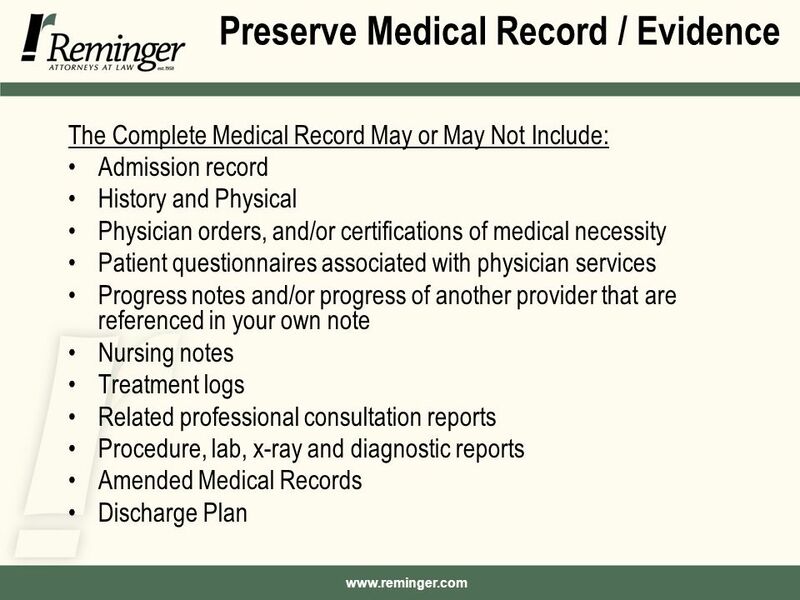 3701.74, medical records may only be provided at the request of a "patient, a patient's personal representative or an authorized person." –The "personal representative" in some instances may include person with health care power of attorney, or an executor of the patient's estate. –A Will naming someone as executor is not sufficient. The Will must be probated first. The Court must then provide the designated person with a letter of authority. 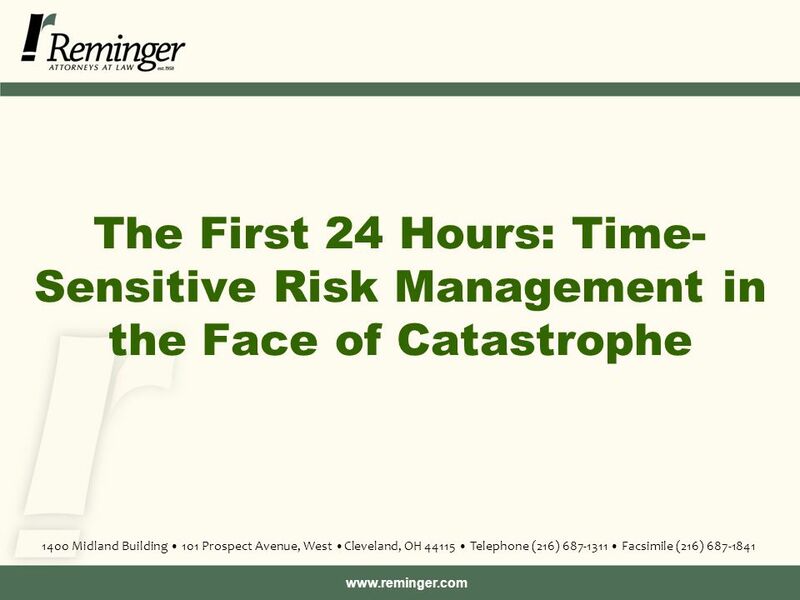 Download ppt "Www.reminger.com The First 24 Hours: Time- Sensitive Risk Management in the Face of Catastrophe 1400 Midland Building 101 Prospect Avenue, West Cleveland,"
Legal Issues for Arizona Design Professionals January 25, 2007 Dennis I. Wilenchik Tyler Q. Swensen. 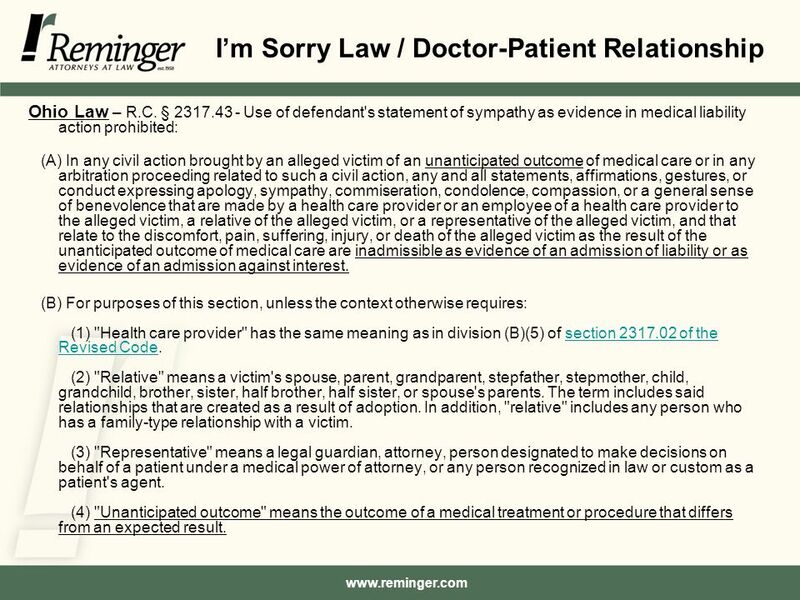 Federal Rules of Civil Procedure 26(f) and In re Bristol-Myers Squibb Securities Litigation Lina Carreras. Independent External Review of Health Care Decisions in Vermont Department of Banking, Insurance, Securities and Health Care Administration. Lisa Endres General Counsel Oklahoma State Department of Education. 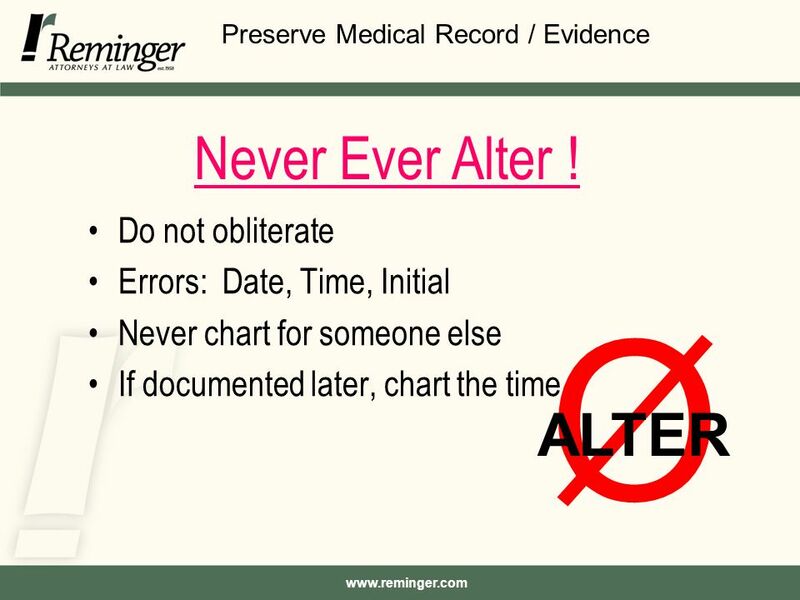 Advance Medical Directives Protocols for Mental Health While every effort has been taken to verify the accuracy of the content of this presentation, ValueOptions. Professional Liability and Medical Malpractice Health Science / Practicum. The Legal Implications of Practice Guidelines Cal Chaney, JD April 12, 2002. Q UINCY COLLEGE Paralegal Studies Program Paralegal Studies Program Interviewing & Investigation LAW-123 Preparing for an Initial Client Interview. 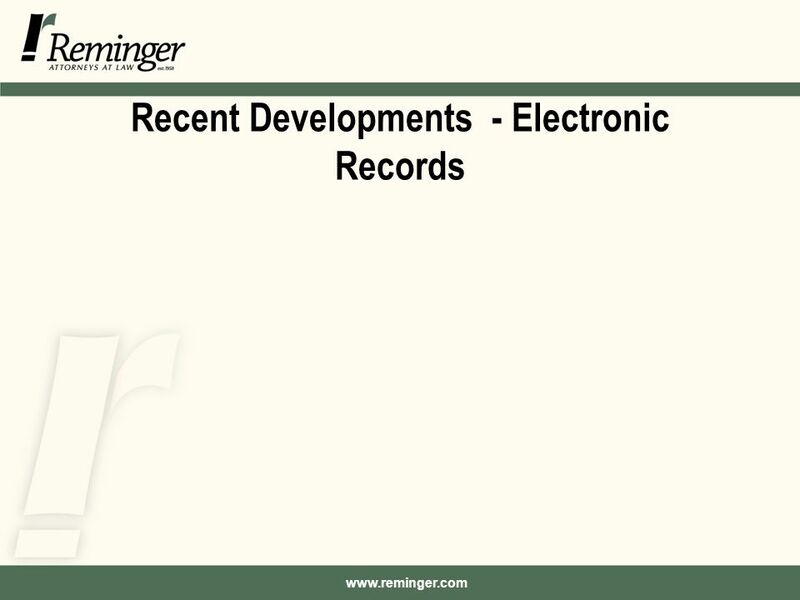 New HR Challenges in the Dynamic Environment of Legal Compliance By Teri J. Elkins. PRIVILEGED COMMUNICATIONS W. DAVID LEE Senior Resident Judge District 20B 2006 Superior Court Judges’ Conference Wrightsville Beach, NC June 15, 2006. Patient Protection and Affordable Care Act March 23, 2010.